Viewable Area: 20.91" x 67.91"
Packing Size: 26.38" x 80.12" x 3.35"
Sign display units continue to prove themselves as the single most effective and affordable form of commercial marketing. 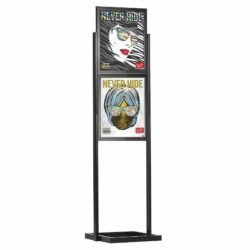 These poster holders which also known as menu holders, provide the ultimate finish to any form of advertising or hardcopy visual content. They are guaranteed to lend a sophisticated and polished look to a boundless range of promotional materials. Without questioning, sign displays are the most versatile form of advertising and, with the appropriate graphics applied, they are guaranteed to solicit the attention of numerous customers and provide a clear and long lasting message to future clients. 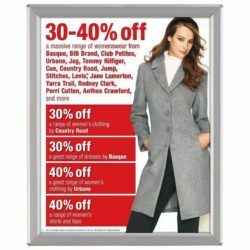 When it comes to communicating with customers and other interested parties en masse, sign displays as poster stands are the most appropriate and constructive means of achieving your specific marketing aims. 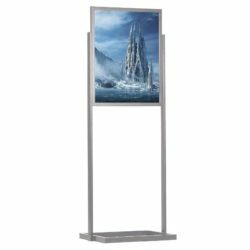 The poster holders are manufactured to occupy a height of 66″ and have the capacity to support graphics with dimensions of 22″ x 69″. These are the standard size units for indoor display units, however, alternative measurements are available if required. Regardless of size or intended use, all sign displays are finished with quality craftsmanship and materials. The poster holders are produced with an aluminum finish and are complemented by a satin silver color scheme. 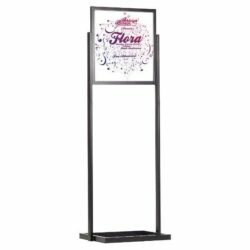 The neutral and classic aesthetic of the sign holder ensures it will perfectly match any images, posters, advertisements, event listings or other graphics designed for display. 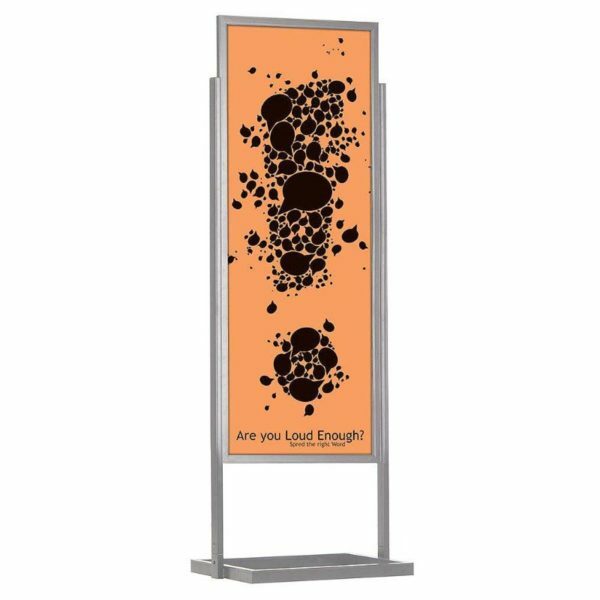 The poster holders have the black PVC in middle of 2 posters prevent light transmission moreover easy to change poster by simply sliding in through the channels of the stand. The sign displays have been specifically designed to seamlessly integrate into your existing business environment. This ensures consistency of branding is achieved and guarantees the frames will not create an obstruction to the present fit out of your commercial space. The aluminum finish of the frame is paired with a non-glare lens, which further adds to the durability of the frame. Images and graphics are simply positioned beneath the lens. There is also the option for double-sided image display to promote two posters in the one frame so that economy floor stand for you. Whether used for single display or double display, the high grade materials used in production will safeguard your graphics from damage and deterioration, making certain that a professional advertisement is maintained at all times. While the poster holder has been tested for longevity, if your preference if for regular rotation of marketing content, then these display units are also a perfect solution. The sign display does not require laborious undertakings for the removal and replacement of prints. The unit features a top insert channel allowing for rapid change over of content. All signs can be positioned in a matter of seconds with high visibility achieved immediately through the transparent non-glare lens. Please be aware, while it is our promise that the sign holders require minimum maintenance and are easy to use, your product will be supplied unassembled on delivery. This is done to minimize shipping costs, and assembly will only be required in a single instance at inception. Very pleased with the standing floor poster display. The price is so affordable, and it is easy to assemble.